​Australian metalheads! Prepare yourselves, as Sinsaenum have set their eyes on Australia for the very first time! 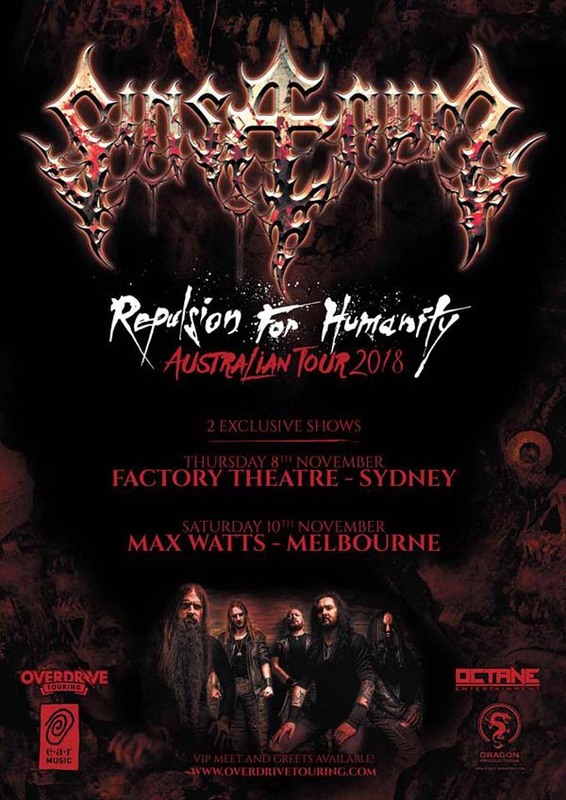 The supergroup featuring Joey Jordison (ex-Slipknot), Frederic Leclercq (Dragonforce), Sean Z (Chimaira), Heimoth (Seth) and Stephane Buriez (Loudblast), will tear the roof off this November on the backs of their latest, bone-crushing release Repulsion for Humanity across two exclusive Australian shows. Formed in 2016 by Leclercq, Buriez and Jordison, the trio quickly recruited Sean & Heimoth and released their debut album Echoes Of The Tortured to worldwide critical acclaim. The supergroup are back with their sophomore release Repulsion for Humanity, out 10th August 10th, and are set on unleashing their very first live offerings to fans around the world. A sonic assault on the senses and pure manifestation of death metal aggression - Sinsaenum will be bringing this to Australia this November. Australian Sins, be ready! Limited VIP Meet and Greet upgrades available for those who want to meet the legendary musicians behind the band! VIP upgrades from: Sydney and Melbourne. Also, Sinsaenum have just revealed the third single from their brand new studio album Repulsion for Humanity. Based on the horror book of the same name, Nuit Noire (French for "black night") is a brutal, fast, angry and extremely violent song, with intense blast beats and intricate riffs, showing another side of the band’s forthcoming second album. The atonal yet melodic guitar solos by Fred Leclercq and Stephane Buriez add to the song’s driving energy. Repulsion for Humanity, the second album by Sinsaenum, is going to be released on Friday 10th August as 1CD (hardcover digipak) and 2LP. Preorders available now.